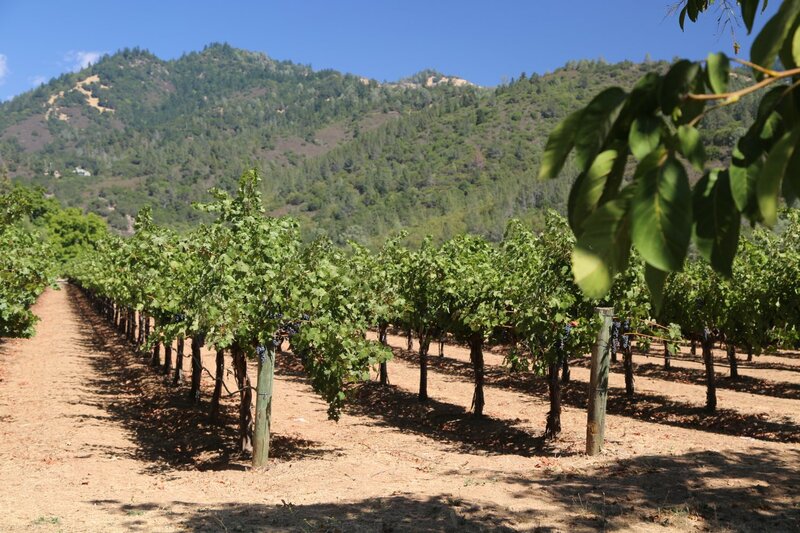 Switchback Ridge has a long family history in Napa Valley dating back to 1914 when property at the base of Dutch Henry Canyon south east of the town of Calistoga just off of the Silverado Trail was purchased by family relatives Eliza and Mads Peterson. 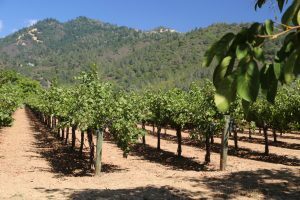 At that time there was a small Zinfandel vineyard planted on site but when Prohibition began in 1920 the property like much of the valley was converted to other crops – in their case to plums and walnuts. 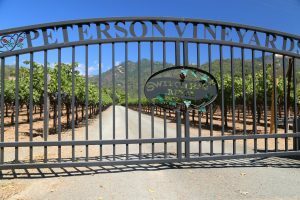 Much later the vineyard was again planted to vines – this time a diversity of varietals was planted; today the Peterson Family Vineyards are planted to approximately 21 acres of vineyards of the total nearly 100 acre property. Three varietals grow here including Cabernet Sauvignon (8 acres), Merlot (8 acres) and Petite Sirah (5 acres divided into 2 for the old block and 3 for the younger vines). 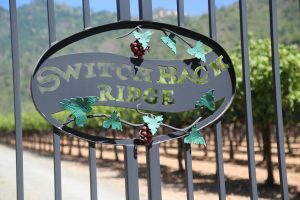 Switchback Ridge was founded by John Peterson and his daughter Kelly Peterson-Holmes (who we originally met with at their vineyard) and is named after a ridge on the upper part of their property which contains a number of switchback hiking trails. Some of Napa’s most intriguing terrain and vineyards are located at the upper end of Dutch Henry Canyon Road (a gated private road which connects to the Silverado Trail and borders one edge of their vineyard). And two prominent vineyard neighbors are nearby – Duckhorn’s Three Palms Vineyard and Hourglass’s Blueline Vineyard. When a beautiful property has been under the ownership of the same family for more then 100 years – it becomes a treasured piece of history. 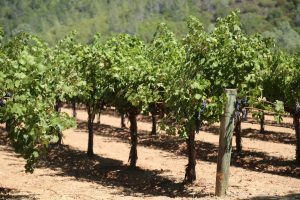 And if the property was under a different ownership, their historical Petite Sirah old block would most likely be ripped out and planted to a varietal that fetches more money in the valley – Cabernet Sauvignon. But respecting Napa’s heritage and their own family’s viticulture history (John has farmed these vines much of his life), thankfully the family keeps these vines in the ground. Their old Petite Sirah block (which also includes other mixed black varietals) is now over 60 years old. For many years, John handled all of the primary vineyard management duties himself (as a child he helped plant some of the Petite Sirah vines). Because of his long history on this property, he has a real feel for the nuances of the property including soil types, microclimates and individual sections of the vineyard. 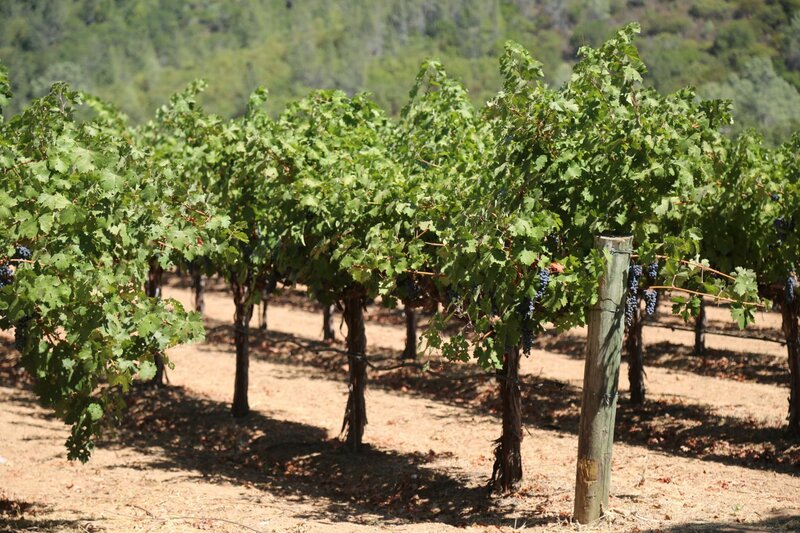 Today the vines are managed by Lopez Vineyard Management Company – under the capable hands of Hector Lopez (his family has been farming in the Napa Valley since the 1960s). 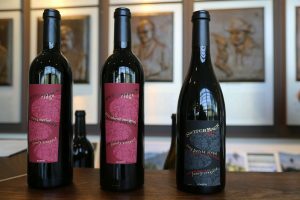 Well regarded winemaker Bob Foley has made their wine since their first vintage; their wine is made at Bob’s own winery on Howell Mountain. And in fact, Bob also purchases about half of their grapes each year for his own wines. Their first commercial Vintage was from 1999. They produce three estate wines every year, typically each 100% varietal (but sometimes slightly blended): Merlot, Cabernet Sauvignon and a Petite Sirah. 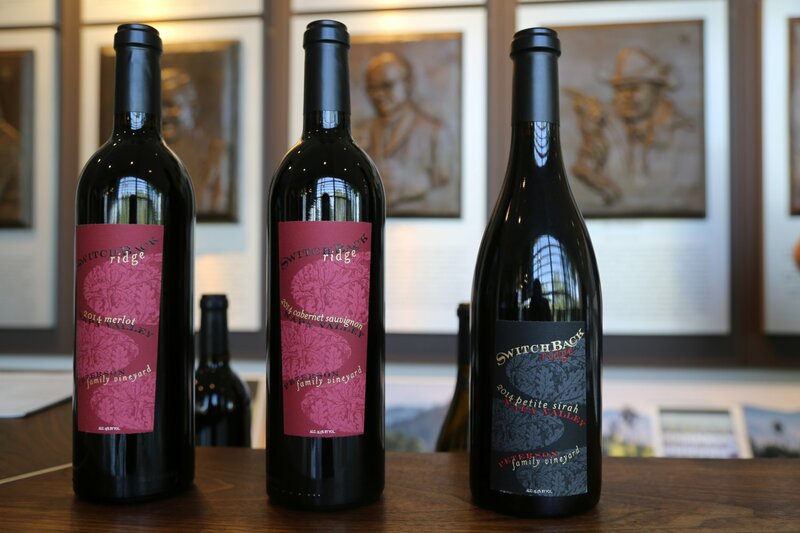 We tried all three from the 2005 vintage and almost ten years later tasted through their 2014 vintages. Compared to their Cabernet Sauvignon and Petite Sirah, their Merlot tends to be a softer wine that is fairly balanced and approachable in its youth. The 2005 Switchback Ridge Merlot offers hints of mint and accents of eucalyptus on the bouquet. Highly aromatic with both fruit and herbal notes. 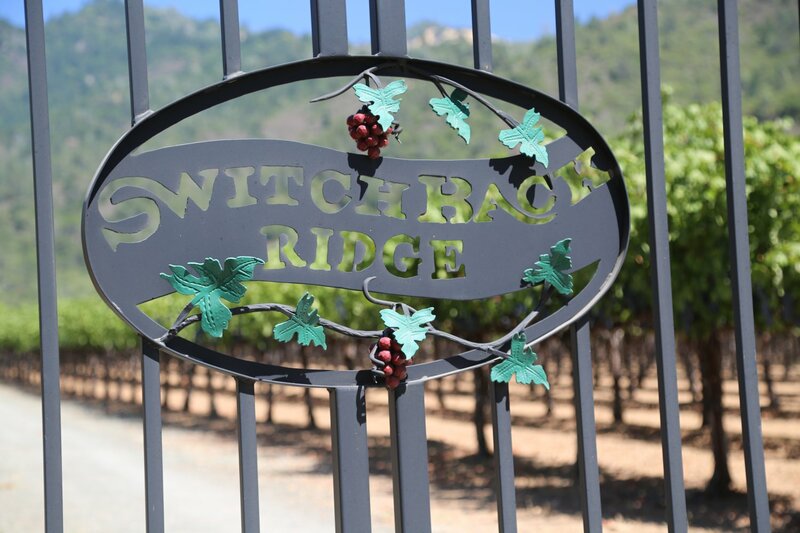 The 2014 Switchback Ridge Merlot (is blended with 10% Cabernet Sauvignon) offers a diversity of aromas including darker fruits, black licorice, hints of cedar and tobacco smoke. Feels nice on the palate with acidity that dances across your palate. Long lasting but fairly well integrated somewhat earthy tannins. The 2005 Switchback Ridge Cabernet Sauvignon is a very dark inky wine. The nose is full of ripe juicy blackberries. It is a seductive wine with many layers of flavor. The finish has strong but well managed tannins that lingers well after you swallow. The 2014 Switchback Ridge Cabernet Sauvignon is 100% varietal but a blend of two Cabernet Sauvignon clones – clone 337 (tends to be a bit softer with floral and red fruit characteristics) and clone 7 which tends contribute excellent structure to the wine. 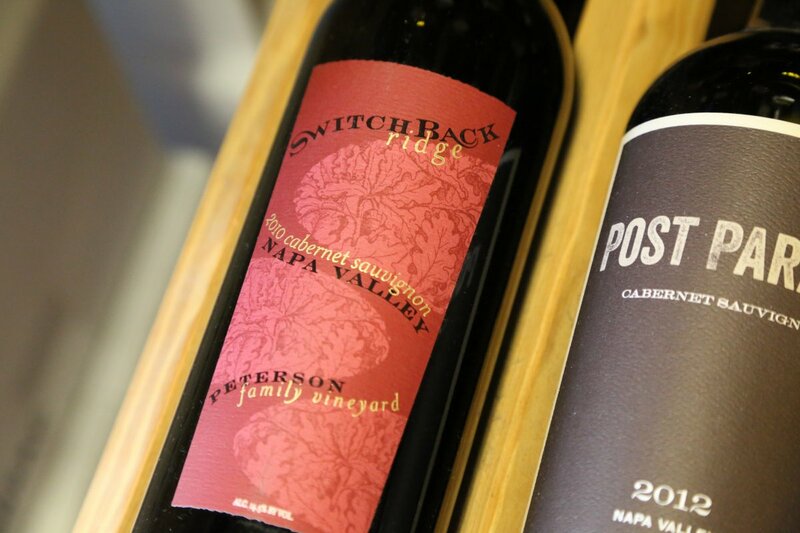 The 2014 Switchback Ridge Cabernet Sauvignon shows dark in the glass – with aromas of dark fruit (mostly cherry and blackberry) with nuances of tobacco leaf and licorice. Shows excellent concentration with powerful fruit and fairly robust tannins that anchor a long finish. This is a full-bodied wine but well balanced between fruit, acidity and structure. Their Petite Sirah wines when consumed young show best when paired with well marbled steaks. They tend to age extremely well – Kelly’s husband Ray told us that some of the earlier vintages are showing quite well 10-15 years after their vintage date. The 2005 Switchback Ridge Petite Sirah is all about the fruit. It is a robust wine – a significantly bigger wine than even their Cabernet Sauvignon and as a result it needs to breathe before you drink it. Decanting is recommended. It has chocolate overtones on the nose. It is aged in neutral oak so there are no dominating toasted oak, cocoa, vanilla or other characteristics that are often imparted with new oak barrel aging (depending on the cooper of course). Strong tannins show on the finish dominating a very youthful wine (at the time of our tasting). The 2014 Switchback Ridge Petite Sirah is inky dark, jet black – the heart of darkness in the glass one might say. This wine is a blend of about 75% Petite Sirah from their newer vines with about 25% harvested from their old block. Shows dark and brooding on the bouquet with aromas of mushroom, forest floor, leather, a floral note (violets) and ripe blackberry. It is savory both on the bouquet and palate. The wine is big… no, that is to light of a description, it is a significant event across your palate – dense, layered and extremely full bodied. Muscular and chewy tannins anchor intense fruit, with mouth watering acidity – this is a finish that you will remember – it has great persistence. We wonder what the 2013 vintage of this wine was like (a vintage that in general produced big red wines from the Napa Valley which took plenty of time to open). 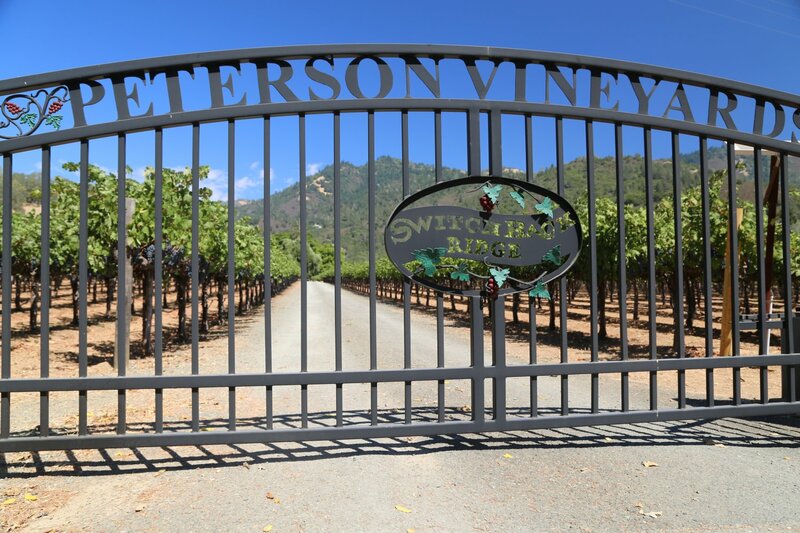 NOTE: visitors to the valley wanting to taste the Switchback Ridge Wines can do so by appointment at Phifer Pavitt Winery in Calistoga through a special collaboration between the owners of each of these properties. We have also seen their wines being poured on occasion at the the Culinary Institute of America at Copia in downtown Napa.